It is becoming a more familiar scene in health care. Physicians, nurses, pharmacists, therapists, and social workers are working as a team to care for patients in a free clinic. But this team is comprised of students from UCF – and it’s just one of many innovative interprofessional learning opportunities being offered to prepare students for the future of health care. “The earlier interprofessional education is introduced in nursing education, the better off the students will do in all settings – from the classroom to the hospital and the community,” said Heather Peralta, an adjunct instructor at the College of Nursing who established the student-led interprofessional clinic for farmworkers in the Apopka community. Preparing a “collaborative practice-ready” health care workforce is necessary, according to the World Health Organization. WHO, along with the landmark Institute of Medicine “Future of Nursing” report, the Commission on Collegiate Nursing Education and the National League for Nursing, have acknowledged interprofessional collaboration – from education to delivery – is key to health care’s future. It provides safer, quality care that is more efficient and cost effective, improving patient outcomes and ultimately the health of the community. Through interprofessional education, students learn interdisciplinary communication skills, an understanding of the roles and scopes of practice of each discipline, and develop mutual trust and respect. Opportunities for interprofessional education are available for undergraduate and graduate students, and include hands-on clinical experiences, collaborative patient care and clinical scenarios followed by interactive discussion, and simulated learning. 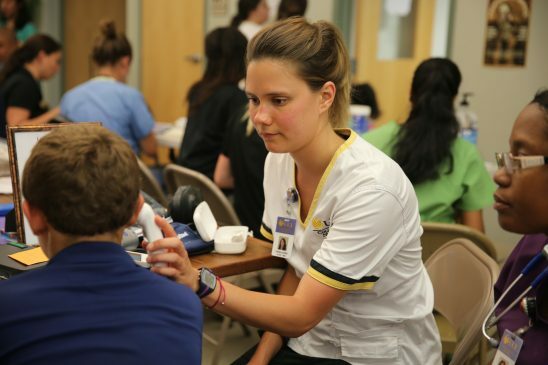 For example, graduate students in the Adult-Gerontology Acute Care Nurse Practitioner program collaborate with students from the Athletic Training program annually in a one-day event to learn to assess, diagnose and manage sports-related acute conditions such as concussions and spinal injuries. Nursing instructor Nancy Duckworth organizes three interprofessional education events annually where undergraduate nursing students from the Orlando and Cocoa campuses collaborate with students from the College of Medicine, the School of Social Work, the Physical Therapy program and the University of Florida College of Pharmacy in Orlando. In a recent training, students worked together leveraging their unique skill sets and knowledge to create a comprehensive wellness care plan for geriatric patients. “Working as a team allows everyone a chance to feel valued and participate as an active member of patient care to ultimately improve outcomes,” said Duckworth. When multiple disciplines come together to care for patients, the community also benefits. In the future, communities will reap the rewards of these “collaborative practice-ready” professionals – like the one in Central Florida is already. Since July 2016, more than 80 students have provided free health care to more than 450 patients in an underserved community of Apopka. The interprofessional education program has received national recognition from the U.S. Public Health Service and Interprofessional Education Collaborative. These efforts are just the beginning. As one of the nation’s largest universities, UCF is leveraging its strengths in health care to create an Academic Health Sciences Center at Lake Nona Medical City in Orlando. This unique interdisciplinary center will bring together the College of Medicine, College of Nursing, and a new College of Health Professions and Sciences on the 50-acre, state-of-the-art UCF Health Sciences campus at the global destination for medical innovation in Lake Nona. Through the Academic Health Sciences Center, UCF will continue to be at the forefront of health care education. “The eventual move to Lake Nona will provide our students even greater opportunity to work more closely as a team with other health care disciplines,” said Duckworth. “Being a part of the new Academic Health Sciences Campus is so important as we will be able to do more interprofessional education, working together for the betterment of all communities in Florida and beyond,” adds Peralta.